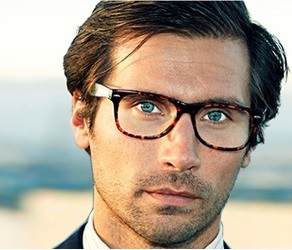 Are 1.67 or 1.74 High Index Lenses Right for You? You Are Here: Home » High Index Lenses » Are 1.67 or 1.74 High Index Lenses Right for You? These days, eye glasses are no longer just a necessity, they are a fashion statement. People have come to the realization that just because your eye sight is not 100% does not mean that you ha ve to sacrifice a sense of style. In fact, glasses have become such a popular accessory that many people wear them with weak or non-existent prescriptions. Unfortunately, not all of us are that lucky and most people who wear glasses do need very strong prescriptions. That said, the thick Coke-bottle-esque lenses are anything but flattering to the face. This often causes the wearer to feel old and possible act that way, but that does not have to be the case. With recent advances in technology and eye wear, an alternative to those cumbersome glasses is now available. High index lenses are the lightest frames available and often recommended for those people who need very strong prescriptions for astigmatism, nearsightedness, or farsightedness. The most popular ones are 1.67 or 1.74 high index lenses, but what does that mean? Do high index lenses make sense for me? If your prescription is below +1.00 or above -2.00 then maybe you should wait as you will not notice much of a difference. If your prescription falls outside the range above, then your glasses are probably feeling heavy on your face and you should start to consider high index lenses as an option. High index lenses can sometimes have a greater possibility of reflection and light discoloration and a rainbow effect. If you do not need the high index lenses then maybe you should wait in order to avoid this possibility. If you are an active person then maybe wait to get the high index lenses. While there are countless benefits, they can sometimes be more fragile and might not be the best when biking or playing basketball. What are the differences between the types of high index lenses? There are some fundamental differences that impact the type of high index lens you should get after deciding to go that route. The two most popular types are below. 1.67: Best for prescriptions of +/- 3.00, these lenses will be up to 1/3 thinner than the regular lens made out of plastic. 1.74: Best for stronger prescriptions of +/- 5.00 and above, these lenses are the thinness and lightest option for high prescriptions and are as much as 1/2 the thickness of standard lenses. So should I get 1.74 or 1.67 high index lenses? There are several aspects to consider when making this decision. Price: 1.74 high index lenses are more expensive than 1.67 high index lenses. If you do not need them for a strong prescription than there is no reason to spend the extra cash as they will not be any better for your eyes. Color: 1.67 high index lenses are available in more colors and tints. Transition lenses cannot be 1.74. Size: If glasses are bothersome and heavy, it may be better to go with the 1.74 high index lenses to get your frames as light as possible. 1.74 high index lenses are flatter, thinner, and most importantly, more cosmetically appealing than any high index lenses available. The fact that they are lighter and thinner give you more options for stylish frames. While they are nearly half the thickness of 1.50 index, they are also 13% thinner than 1.67 index. Furthermore, by using top of the line technology, they eliminate that awkward “eye-shrinking” effect that many high prescriptions cause. For all of these reasons, many people consider these lenses the ideal option that is available, but only you know what is best for you. 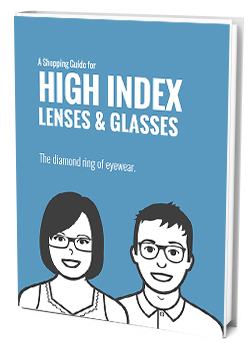 If you would like more information on wether 1.67 or 1.74 High Index Lenses are Right for You, go to highindexlenses.com or check out their free eBook on high index lenses.